If you run an e-commerce business, you need social media to promote the products you sell or to tell your consumers about a special offer. The marketing material you post on social media — be it Instagram post, Facebook post or Twitter post — plays a vital role in attracting your potential consumers. Therefore, you need to create as attractive as possible marketing material before you post it. If you have tight budget, you don’t need to hire a designer to help you create decent marketing materials to be posted to the social media accounts of your business. Give Picmote a try and you will know that creating a beautiful marketing material in the digital era is not that hard as you might thought. Even if you have no design background at all. Picmote is an online design tool that is designed specifically for e-commerce. With this tool, you can effortlessly create beautiful marketing materials. From ads banners, social posts and product thumbnails. Picmote has lots of ready-to-use templates which you can use according to the design you want to create. You can tailor the design according to the campaign you want to run. For instance, you can add a promotional element like “New Arrival” to announce your new products. What makes Picmote different to other online design tools? Picmote is not the only online design tool out there. Tools like Canva and Crello are there with the same purpose, to help those with a poor design skill to create a decent design. Picmote is roughly the same as those tools, but — as mentioned earlier — this tool is designed specifically for e-commerce industry. You can use this tool to create marketing materials like Google Ads display, Facebook ads, Facebook posts, Instagram post, and Twitter post. You can also use it to create product thumbnail or other promotional banners with customized size. 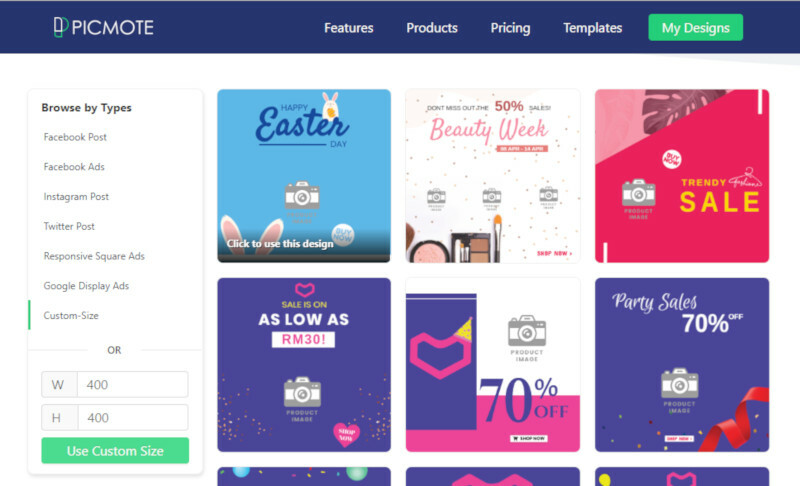 Since Picmote is designed specifically for e-commerce, the elements you can add to your design tend to limited compared to similar tools like Crello and Canva. Picmote provides only promotion-related elements like promo texts and call-to-action buttons. Fewer elements is not always bad. Instead, it can be a good point since you don’t have to take too much time only to select what element you want to add to your design. Other elements like text, background, and shapes are also available in case you want to create your design from scratch instead of template. Picmote comes with an easy-to-use interface. Even if you are a new user, you won’t meet any serious problem to use this tool. Picmote has a drag-and-drop interface. You can add a new element by clicking a menu on the left panel and select the element you want to add. Seconds later, you will see the element on your design. You can set the position of the element by dragging it to another spot you want. To edit a text, you can simply click the text you want edit and some options will appear, allowing to change the text color, text size and alignment. To delete an element, you can simply click the delete button on the menu bar. Picmote also has an undo button to cancel the last action you did on your design. Unfortunately, Picmote doesn’t support keyboard shortcut. It would be great if you could use delete key on keyboard or Ctrl+Z. More is not always better. Probably, it is what the developer of Picmote believe in. It’s right, more options is not always better than fewer options. Compared to its competitors, Picmote has fewer templates and design elements. However, once again, Picmote has the focus to help you create marketing-related designs. So, the design templates and elements offered by Picmote have been specialized for that purpose. 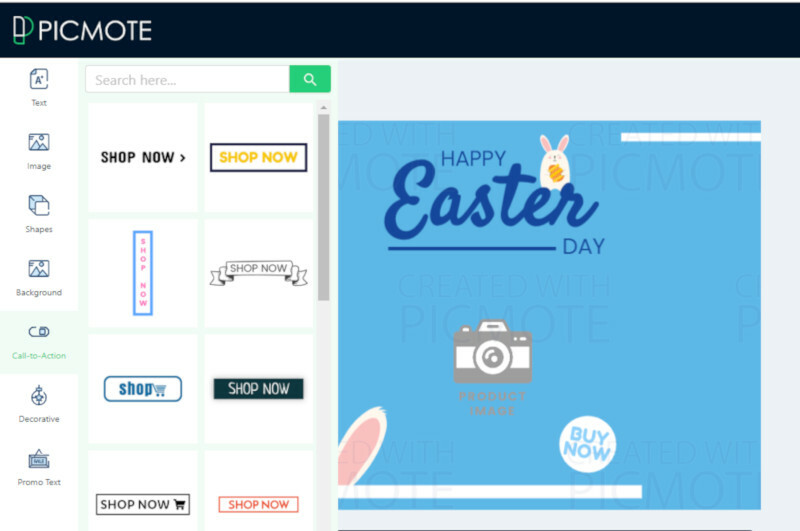 Nearly all templates offered by Picmote contain a “shop now” or “buy now” button. Every template on each category already has an exact size. You can also set a custom size if you want to create a display ads for your website. When designing a promotional material using Picmote, you can also add the image of your product. But first, you need to upload the image of the product to make it available on your Picmote gallery. Picmote supports both single and bulk image upload. To upload new images, you can click the My Gallery menu on the Picmote dashboard and click the Upload New Image button. From here, you can also delete unused images to simplify your gallery. Picmote itself offers unlimited storage so you can store as many images as you want. It also possible if you want to reuse the old designs you have used before (with editing or not). You can see all of the designs you have created by clicking the My Designs menu on the Picmote dashboard. There are three things you can do to each design: edit, copy and delete. To go the Picmote dashboard, you can click the My Designs button on the top-right corner of Picmote design editor. This is another difference between Picmote and its competitors. While tools like Canva adopt subscription model — meaning that you have to spend monthly or yearly budget even if you don’t use it during certain period — Picmote offers a more flexible buying option. You will only be charged for every design you download. Every single Picmote download costs $1. More interestingly, Picmote offers top up model. The only downside maybe is the payment method where Picmote only accepts credit card (MasterCard and Visa). There is no option to top up via PayPal yet. Social media is the integral part of today’s society. Like it or not, you need to invest on it to grow your business. The very first thing you need to prepare before posting promotional posts to the social media accounts of your business is to prepare the contents. Picmote is a nice tool which you can use to create beautiful, engaging social media contents. You can use it even if you have no design skill background at all. There are lots of ready-to-use templates you can choose from and you can also tailor them according to your need. 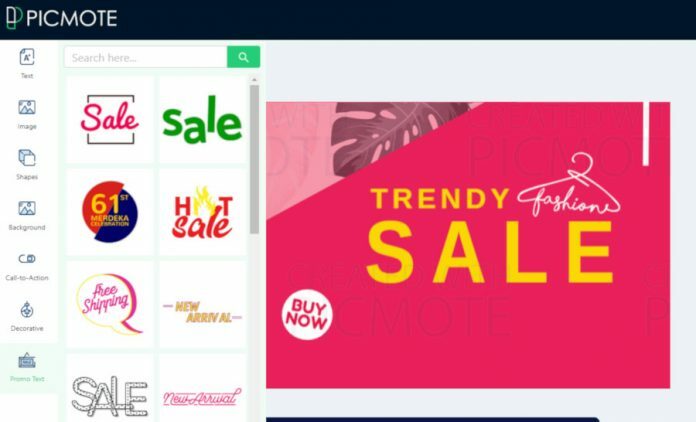 Picmote is an online design tool that is designed specifically for e-commerce industry, so it is probably the best tool if you run a business that sells something directly to consumers like shoes, clothes, and other products. All design templates and design elements have been specialized for promotional purpose. This tool has a very flexible buying option. Instead of subscription model, you will only need to pay if you want to download the design you created. No need to spend monthly/yearly budget.